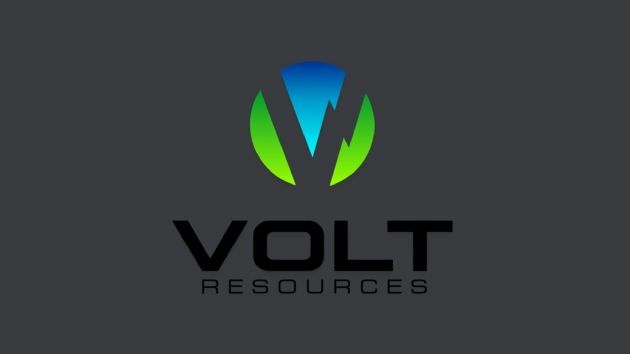 Volt Resources Limited (ASX:VRC) is continuing its strategy to recruit the best talent available and ensure management&apos;s stated targets are delivered. As such, Volt is pleased to welcome Mr Mark Hoffmann to the team as Project Manager. 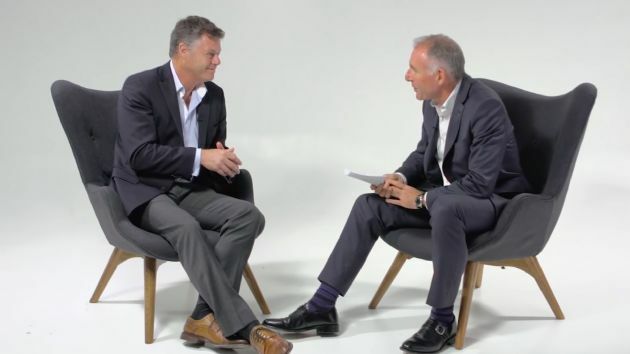 VIDEO: Volt Resources Ltd (ASX:VRC) are pleased to provide a Corporate Overview Video regarding the Company and its projects. 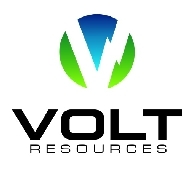 Volt Resources Limited (ASX:VRC) is delighted to announce it has appointed Mr Michael Lew as VP Business Development, North America and Europe. Mr Lew has material applications experience in the energy efficiency sector and interacts with battery manufacturers, especially those affiliated with the transportation and energy storage sectors. Volt Resources Limited (ASX:VRC) is delighted to announce significant progress at its flagship Namangale graphite project. 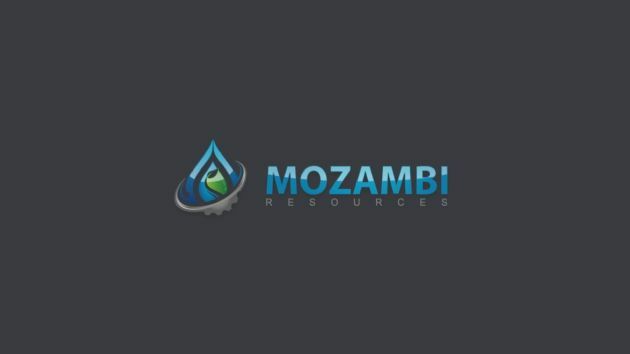 The reverse circulation and diamond drilling program, required to determine the resource upgrade, has now been completed. In addition, substantial mineralisation was observed which extends existing discoveries on each deposit. Volt Resources Limited (ASX:VRC) is pleased to announce the latest round of optimised test results from its metallurgical test-work program, which confirmed the ability to produce +99% TGC concentrates across all three of its key graphite deposits from the Namangale project. 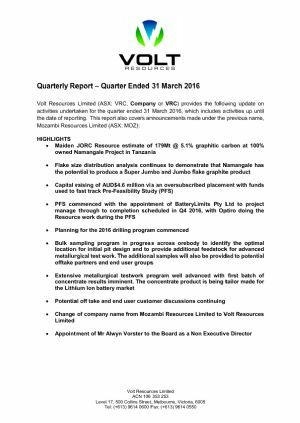 Volt Resources Limited (ASX:VRC) is pleased to provide the following update on activities undertaken for the quarter ended 30 June 2016, which includes activities up until the date of reporting. Volt Resources Limited (ASX:VRC) ("Volt", the "Company") is pleased to announce the latest optimised results (July 2016) from its metallurgical test-work program confirm it has the highest Super Jumbo and Jumbo graphite flake distribution amongst its East African peers. 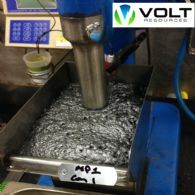 Volt Resources Limited (ASX:VRC) is delighted to announce that optimised results from its metallurgical test-work program have now been received. These show further improvement over previously announced results with exceptional high purity graphite concentrates produced up to 99.3% TGC. 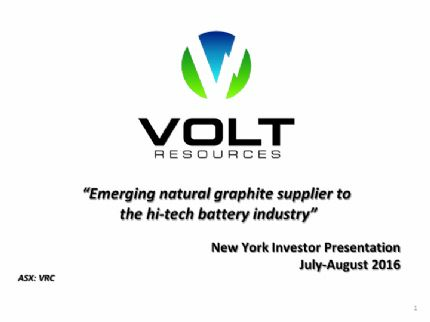 Volt Resources Ltd (ASX:VRC) are pleased to provide the Company&apos;s latest Hong Kong Investor Presentation for June 2016, titled "Emerging natural graphite supplier to the hi-tech battery industry." 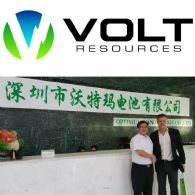 Volt Resources Limited (ASX:VRC) is pleased to announce that it has successfully signed three non-binding Memorandums of Understanding ("MOUs") with high-quality Chinese off-take partners in the high-tech lithium-ion battery market. The combined total of graphite off-take stated in the non-binding MOUs covers annual production of 100,000 tonnes per annum.